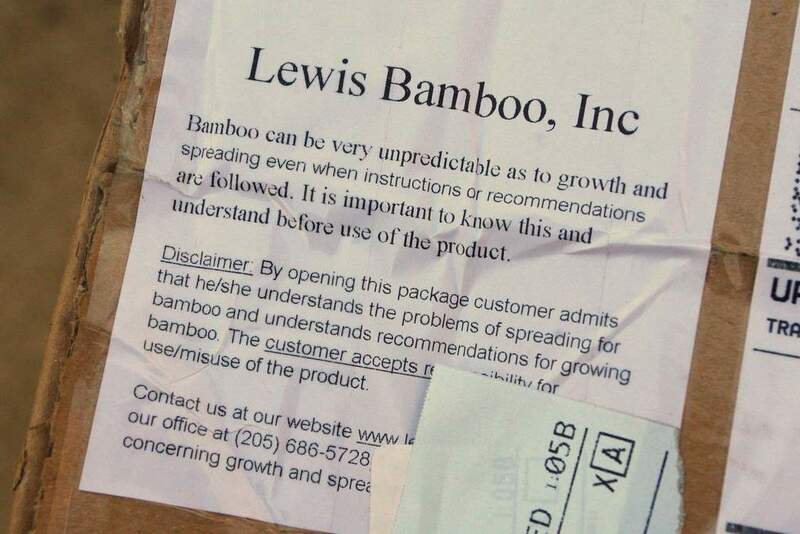 One "problem" with mail-order bamboo is that in order to be delivered by the postal service or UPS, the plants need to fit into a box of a reasonable size. 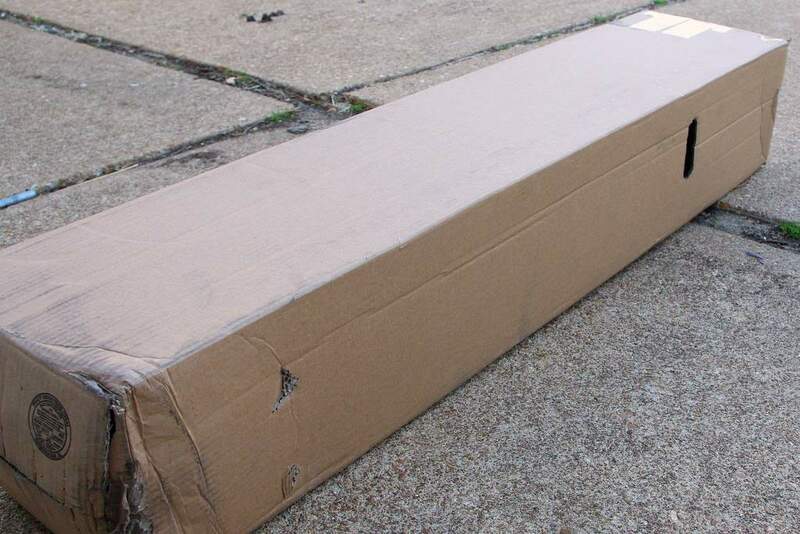 This either means: 1) small plants, 2) plants that are "topped", or pruned to fit into the box, or 3) plants with culms that are flexible enough to be folded into the box. I would like to have seen some evidence of rhizome growth, but this must be a fairly new division that was dug earlier this year, and hasn't had time for new rhizomes to grow. 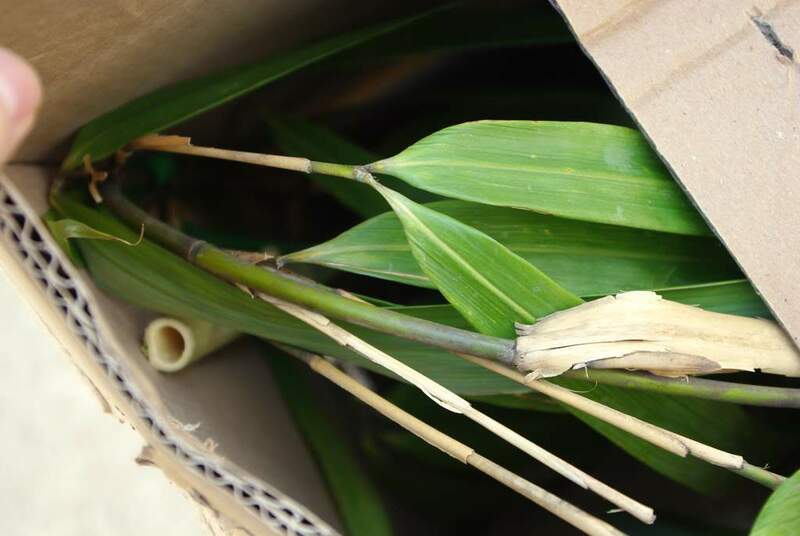 I trust that they know what they're doing at Lewis Bamboo, and that there are some viable buds on the existing rhizome that will create at least one new rhizome. If there aren't, this plant will never grow larger and will die in a few years. I would be very surprised if that happened though. Trying to fit a square peg into a round hole. So into a pot it goes. One of the best things about getting field-dug plants from other parts of the country is you get to see what other soils look like. The soil on this one seems very silty to me; very different from my soil. 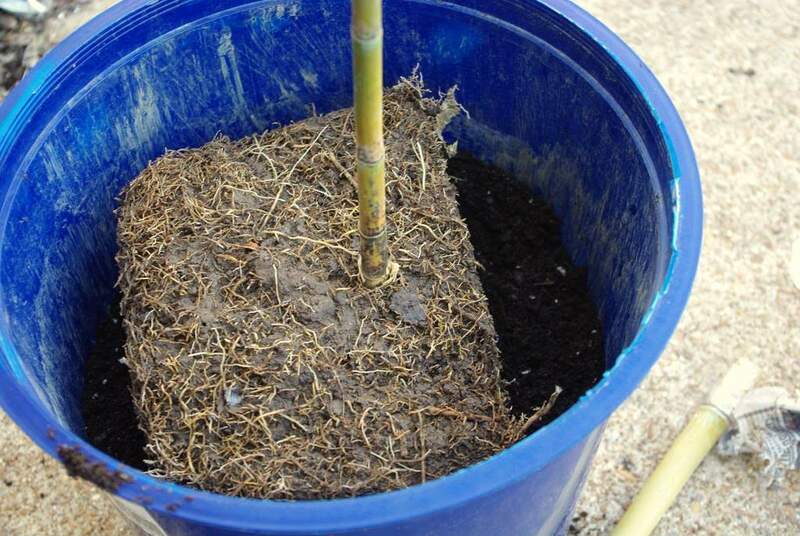 I use a lighter potting soil on my plants, so soil type of the division doesn't really matter. This photo taken from the deck. And that's the job done! 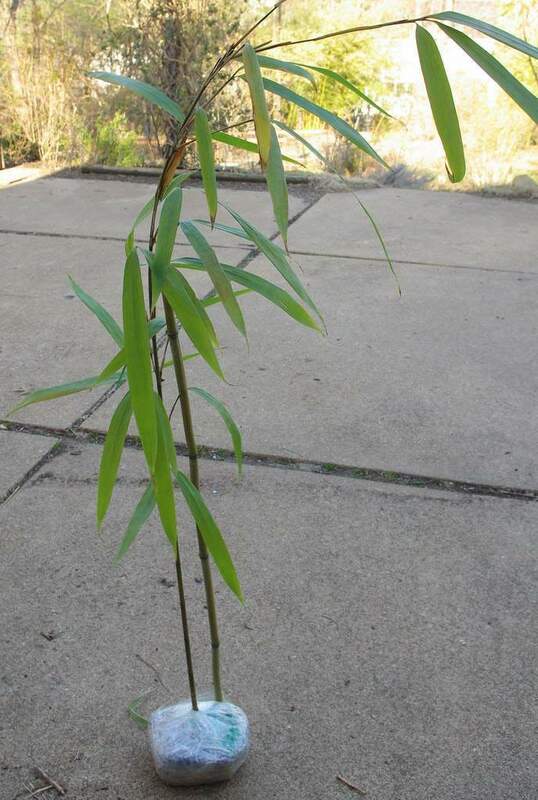 This bamboo is Pseudosasa amablis, or "Tonkin Cane" bamboo. It has nice large leaves, and will have a very tropical appearance when it fills out more. This species is most likely not cold-hardy here, so I'll need to give it winter protection. It will stay in a pot for a few years until I can divide the plant and put part in the ground. 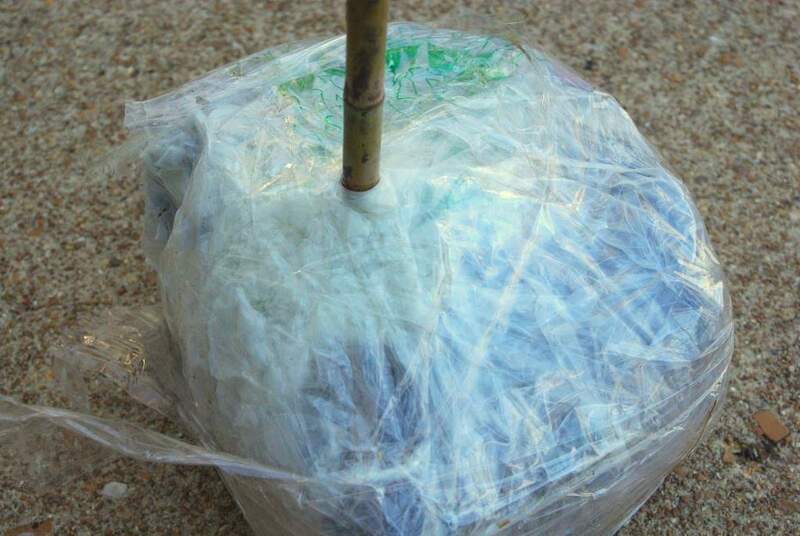 It may end up staying in a pot forever though, which is fine with me -- bamboo in a pot is still quite beautiful! Unfortunately the cold weather returned after I potted this up, so the plant has been staying in my garage. I'm eager for it to warm up again so I can move it back outside, as I'm sure it would appreciate some natural light. So that's a look at my newest bamboo. I wonder if I'll be getting any more this year? Field divisions are almost always viable especially if they already have new roots coming out of the division, but they do usually take a whole year to make decent sized shoots, but now is a pretty good time to get it given that they didn't shoot yet in Alabama. 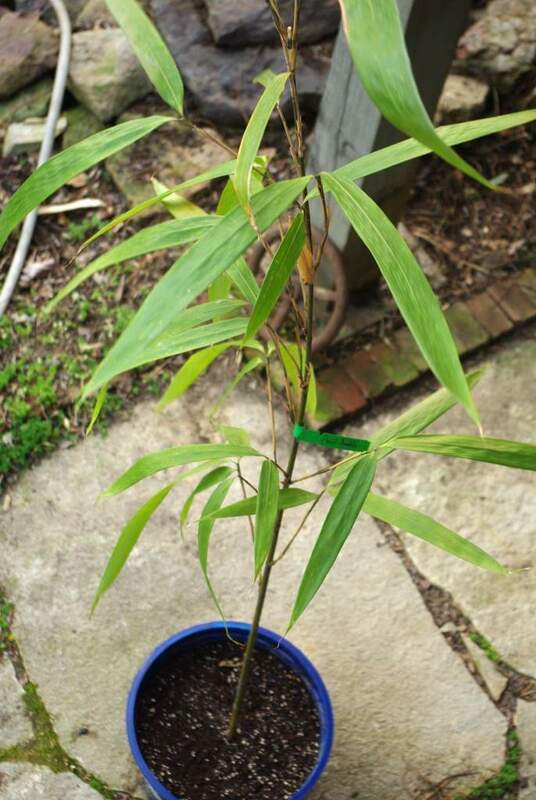 All the bamboos I got when I was new to bamboo were ordered on the internet, and I've only had one plant that wasn't viable. 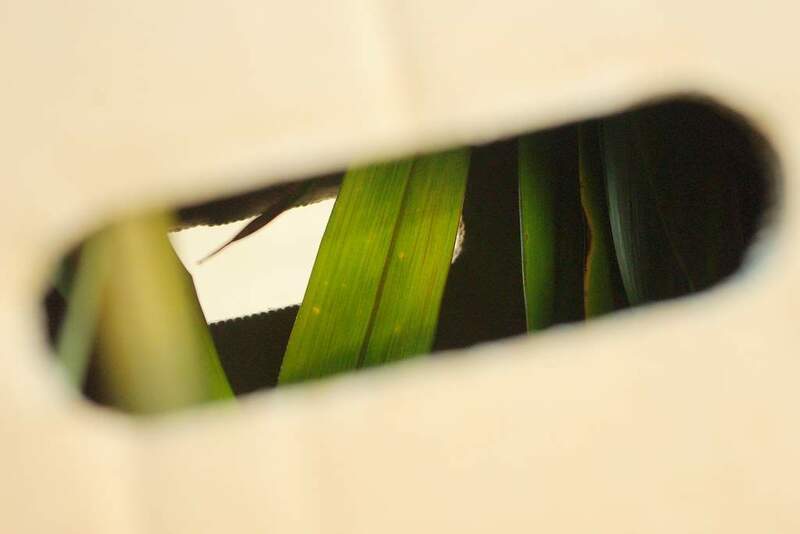 Wow, i love that style of posting, the boxhole photo, and there...the whole post. I love it. I am amazed at people though, that's all of us, you from the temperate zones love to plant tropicals, and we from the tropics want to plant those from temperate zones! Amazing, as if we run out of plants to grow. I think we really want to have some difficulties in lieu of the satisfaction of getting the unusual. That's the human race! LOL. 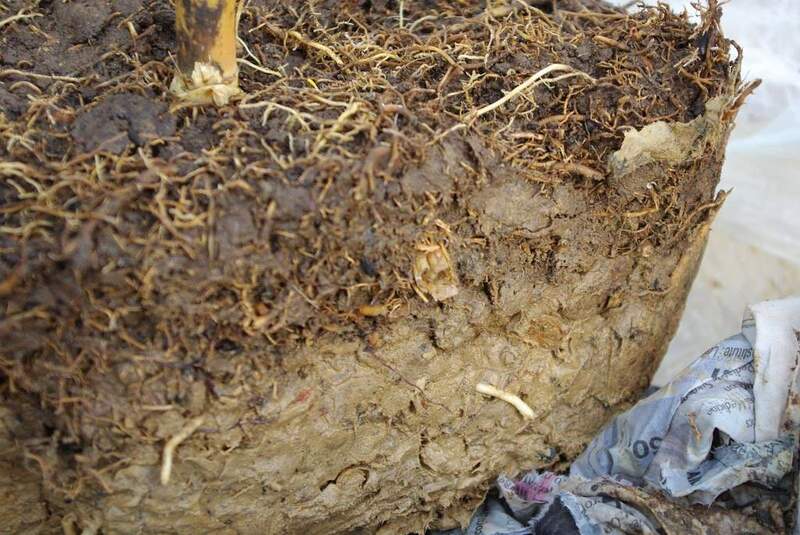 Steve: you can't tell anything about the rhizome from the amount of new root growth, as even a rhizome section with no viable buds can produce new roots. There's also no correlation between success with previously-ordered plants and new ones -- until I see new rhizome growth I won't know for certain if this division has buds or not. 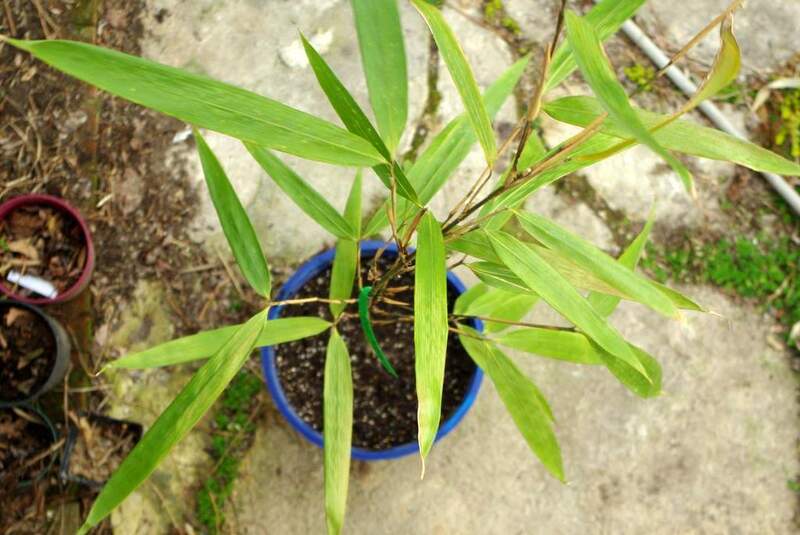 Some bamboo species produce buds at every rhizome node, but some don't. As I said I'll have to just trust the grower's experience on this one, and wait. I appreciate you adding your own experiences here though! Glad to see it in a pot! 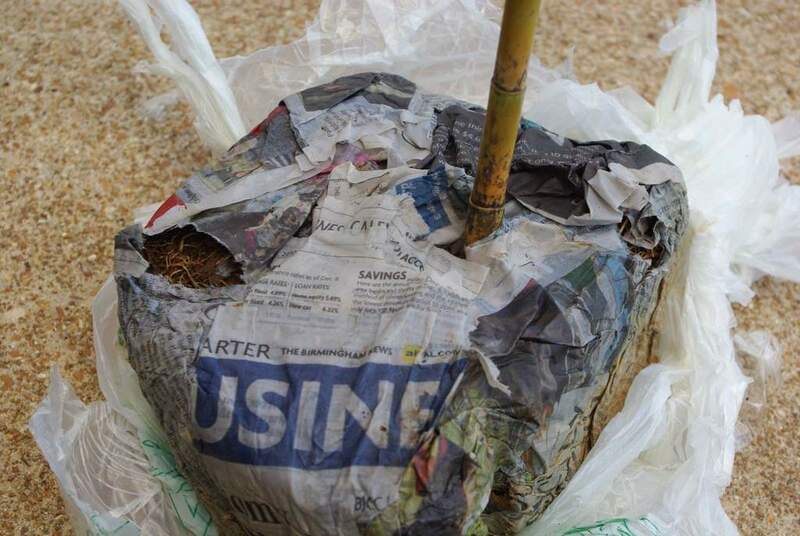 I spent Sunday afternoon digging up bamboo roots from a large specimen we inherited when me moved to our house. Its not in a pot, so the roots are going mad, and I'm definitely losing this battle. They are stunning plants though. Jono: don't click my "bamboo" button near the top of the right column then -- I have several bamboos planted in the ground. It takes a few minutes a couple of times a year to keep it in check. 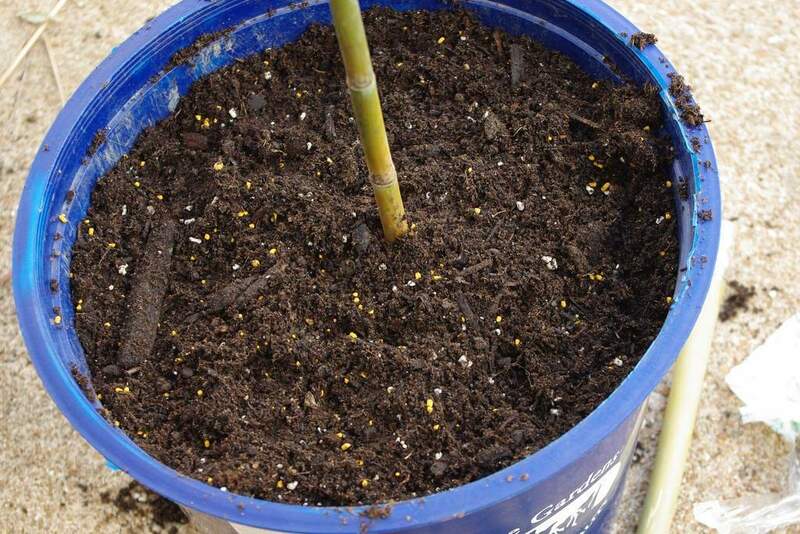 You UK bamboo growers have it easy, as the plants don't spread as quickly as they do here, but I'll be glad to offer you some advice on control if you want to keep it. It's a fabulous looking plant!